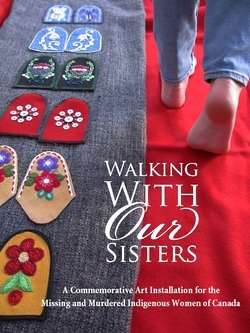 This powerful and inspiring collaborate art project commemorates murdered and missing Indigenous women and girls, primarily in Canada, through the creation of more than 1700 moccasin vamps, the upper portion of a moccasin. The exhibit expresses the pain and loss of our communities, and also our demand that the authorities take action, and stop treating the lives of Indigenous women as unimportant. I was extremely honored to be part of this project, which is now booked for numerous exhibitions throughout Canada and some in the United States, through 2019.